Research is starting to show that Urban gardens are becoming the oasis for honeybees and Monarch butterflies, and now you can bring another amazing insect to your garden…dragonflies. A small pond in the ground or a container, like a wooden half barrel, but “before digging a pond to attract dragonflies, consider whether you live within a few miles of an established population,” says Michael May, a Rutgers University entomologist who is president of the Dragonfly Society of the Americas. “You’ll get faster results if you do.” More arid regions like the Southwest may be more difficult to attract dragonflies, but not impossible. Here are five facts van Dokkum shared with YaleNews about dragonflies. 1. 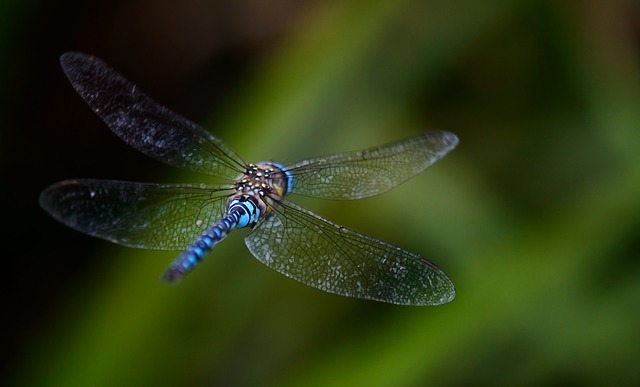 Dragonflies can travel up to 40 miles an hour using their four wings, which each move independently. 2. Their flight also helps them to be very adept hunters; they grasp prey out of the air and are successful 90% of the time, making them one of the best insect hunters. 3. The dragonfly lives completely underwater before metamorphosis. “Dragonfly metamorphosis is quite astonishing because it happens so fast,” says van Dokkum. “In the evening, this ugly aquatic creature climbs up a reed. It is kind of grotesque, and looks nothing like a dragonfly at all. It sits there, and then out crawls a fully formed dragonfly. Once it emerges, it doesn’t change anymore. That’s the body it will have until it dies. This gives dragonflies a certain fragility. With every hit they get to their wings or bodies, they have to just soldier on. They won’t be able to crawl out of their old body. At the end of dragonfly season, you see a lot of dragonflies with tears in their wings, still able to fly and hunt. 4. There are more than 5,500 dragonfly and damselfly species, about 450 of which live in the United States. 5. The dragonfly is thought to be one of the first flying animals, appearing in the fossil record some 300 million years ago. The wingspan of ancient species reached up to two-and-a-half feet, making them the largest insects that ever lived.